After “The Sopranos” bowed in 1999, one of the next programs in HBO's dominance of quality television was 2001’s “Band of Brothers”. The series is comprised of 10 hour-long episodes, so it’s neither a traditional TV series nor a traditional mini-series. Just a unique benchmark in television history. Of course it was the brainchild of Tom Hanks and Steven Spielberg, who wanted to parlay their “Saving Private Ryan” success onto television. The source material came in the form of Stephen Ambrose’s book of the same name. With over $120 million to spend, it was easily the most expensive television ever made. So it’s a given that the series looks and sound 100% authentic. It’s certainly authentic to the new cinematic language of war, that is, the bleached out, desaturated look of “Saving Private Ryan”. Other than CG animation, the new Blu-Ray version of the series is certainly the sharpest looking pictures I’ve seen on my television. The budget also ensured that the technically complex battle scenes are up to the Spielberg quality. And indeed, it fits right in with “Saving Private Ryan” and any filmed war scenes ever put on the big screen. But a repetition of battle scenes for 10 hours will get tedious very fast. Where the series succeeds is how the filmmakers mixed action with character. Take the first two episodes. Ep1 begins showing Easy Company in basic training. They are raw and enthusiastic soldiers ready to be shaped into soldiers. David Schwimmer does a good against-type turn as the anxiety-stricken drill sergeant who makes the soldiers’ lives a living hell. Amid the abuse and backdoor military politics the soldiers bond with each other and become surrogate brothers (hence the title). The series continues the company’s journey starting with D-Day and all the way to the liberation of Europe. Action is not constant, but intermittent, sometimes planned out, sometime random and unexpected. The second episode begins exactly where Ep 1 left off – in a plane ready to drop the soldiers from the air and onto the ground. The episode leads up to the first action for the Company. After the paratroops regroup on the ground, their mission is to take out a trio of artillery guns which have been pounding the Normandy Beaches. The filmmakers are careful to have us understand the tactics, choreography and strategy of the battle. No episode of “Band of Brothers” is the same. As the Company moves through Europe so does the audience, experiencing all the sights, sounds and pain of combat. 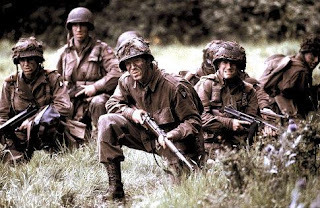 Using “Saving Private Ryan” as it’s bible, we’re saved from overdramatic heroics, patriotism, romantic rendezvous, love letters home or other syrupy melodrama. I never been in combat before and I know nothing on television will come close to the real thing, but I’m glad to know my enjoyment of the series is not mutually exclusive of a real soldier’s enjoyment of the series. Enjoy. “Band of Brothers” is available on Blu-Ray from Warner Home Video. Definitely as good as anything ever put on TV. My first time watching "Why We Fight", the concentration camp episode, ranks easily in my top-3 most incredible dramatic TV experiences (right up there with the Sopranos ending). Absolutely blew me away on so many levels; as emotionally engaged as I have ever been with any TV or film. Another standout of the show, for me, is Donnie Wahlberg's incredible performance as Sgt. Lipton, which makes me resent the ongoing success of his brother.